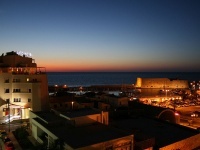 Heraklion is Crete's main city and usually the starting point for holidays on the island. Built on a fairly steep hillside, it's a bustling mix of hotels, fast food outlets, shops and traffic. The main square, Plateia Venizelou, is a pedestrian mall sporting cafes and restaurants, plus some fascinating shops in the surrounding streets. 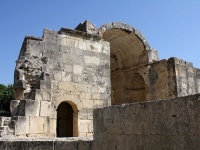 Venetian occupation influenced Heraklion's architecture, as it has in many Greek cities. Indeed, a Venetian fortress dominates the harbour. The archaeological museum is the resort city's pride and joy. It contains the world's most comprehensive collection of Minoan artefacts, dating back to around 1600 BC. 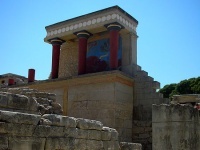 Heraklion is also close to the major archaeological site associated with the Minoans at Knossos. Heraklion is Crete's commercial centre, and has a great many shops. Visitors will find top designer labels and original jewellery for reasonable prices. Antiques, leather goods, folk art, olive oil and a variety of interesting cheeses are also on offer. Some shops may have reduced operating hours during the winter off-season. Visitors will find traditional Greek food on Crete, weather the establishment in question is a cafe, local taverna or elegant restaurant. The island also has many ouzeri, which are bars specialising in the aniseed-flavoured liqueur called ouzo. Otherwise, the city has a number of fast food outlets and restaurants offering international favourites like pizza, pasta, Mexican and Indian food. People-watching from a sidewalk cafe is a favourite evening pastime among locals in Heraklion. The city also has many clubs and bars. Heraklion offers many historic and archaeological attractions, including its world-famous museum and the nearby Knossos, which was the heart of the ancient Minoan civilisation. Sporty visitors will find a number of beaches, as well as opportunities to enjoy rock climbing and horse riding, while the CretAquarium Thalassocosmos is worth a stop for the entire family. Heraklion is a busy, overcrowded city that can be claustrophobic and noisy. Hotel standards do not always live up to expectations and visitors are often harassed by touts outside the restaurants and cafes, particularly in Fountain Square.